I was flying for business quite often for a while, however it was policy to only purchase coach cabin tickets no matter how long your flight was. At first I would look into the business class section, not truly understanding what it was like, but knowing I wanted to try it. The trouble is, once you get a taste of that cushy lounge chair with full recline and leg rest, you never want to go back. Well, the same can be said for a hot bed for your 3D printer, along with some Kapton tape. I always saw the upgrade, and knew one day that I would do it, but until I had it, I had no idea what I was missing. I received my Printrbot Simple X-Axis Upgrade with Heated Bed just the other day and immediately opened the box. There are a few parts that are mostly hidden once installed, but the actual bed stands out with an amazing shiny finish. This is quite different than the mostly black Printrbot Simple, but looks great. It is also very thick. When putting any pressure on the stock bed (removing prints, leverage for removing filament, etc.) it felt as though that bed may bend. This bed and its quality leave me with no worries at all. It was nice to see that Printrbot includes the proper hex wrenches for the upgrade. It’s so easy for a company to leave things like this out, and including them really makes Printrbot stand apart. They also came in handy for putting holes in the radiant barrier (more on that in a minute). As for installation, my preference was to watch the video that is provided on their web page. It is in a bit of a different order than the written instructions. First thing to note is that in the video they do not remove and install the newer longer belt. No worries though, it is pretty straight forward. You can easily pull the old belt out. When installing the new one, put your Printrbot Simple up on an angle, push the belt through on the one side of the gear. You will see it come through the bottom. From the bottom of the Printrbot Simple, thread the belt back up the other side, making sure not to have any wires caught in between the belt and the pulley. The next thing to mention is to make sure you know the proper placement of the bed on top of the mount points. The bed goes on a specific way, and will not fit any other way. This is especially important to note if you have drunk a few strong IPA’s and are somehow convinced that you have the only bed that was not properly machined. Just put the beer down and flip the bed a few more times. Lastly, Printrbot is always improving their product offerings, and now includes a radiant barrier with this kit. This was not in the instructions at the time I looked at them or mentioned in the video. The radiant barrier is attached to the bed heater. You can do this with the screws provided to attach the bed heater. Easy trick for making the holes in the radiant barrier is to lay the bed down and then lay down the bed heater as if you were going to install it. Then lay the radiant barrier over the bed heater. You can then use the hex wrench to press punch holes using the actual holes you will be screwing into. Now you have holes that are perfectly aligned, and you can screw everything in. In the video, it is mentioned that they will need to provide a good amount of Kapton tape to secure the thermistor. They do provide a generous amount which can also be used to help hold all the wiring under the bed in place. They also include a nice piece of Kapton for the top of your new bed to start printing. Don’t forget you need a computer PSU to now power your Printrbot Simple. The old power plug is no longer used. This is needed in order to support the power needs of the bed heater. I have plans to make a small enclosure to house the power connector for the Printrbot along with a 24 pin female connector for the main power plug of the PSU. This is to easily ground the green wire so that you can use the PSU along with providing 5v to some USB ports to run my Raspberry Pi. 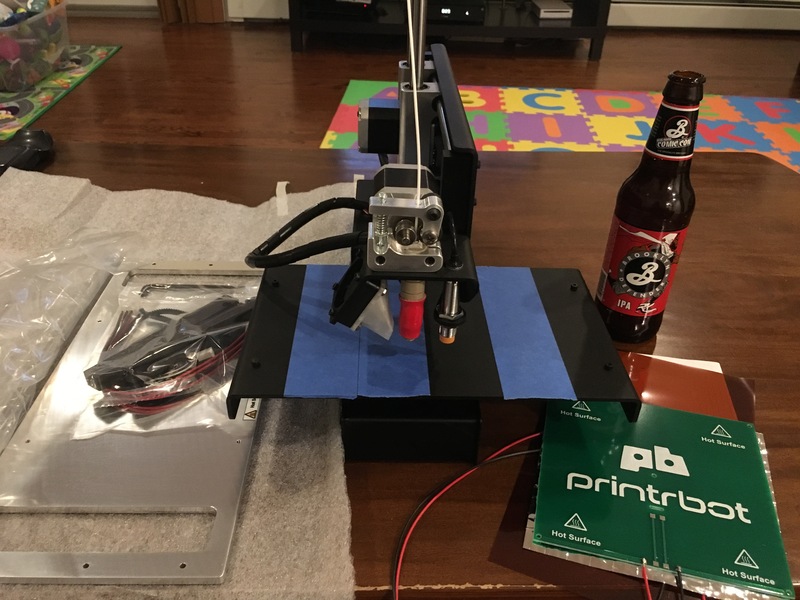 Overall, the Printrbot X-Axis Upgrade with Heated Bed is a must buy. I had no clue what I was missing until now. Its like all the small issues I still had here and there are all gone. my prints are coming out smooth and stick to the bed without any issue. There is currently no more need to use hair spray to help with adhesion to the blue painter’s tape, which is now replaced with Kapton tape. Plus, the upgrade now gives me the ability to print some items that I couldn’t before due to restrictions on size. This is a very high quality upgrade all around, and I highly recommend it!